Pens leak. Ink stains leather and fabric and most everything it touches, but don't despair. Many ink stains can be removed if treated properly. You’ll have better luck salvaging your laundry if you catch the ink stains before putting the clothes into the dryer. Begin by checking each garment for stains. You may have multiple stains to treat. Before you attempt to remove ink from leather, first determine what kind of leather and what kind of ink are involved. Suede: Take your garment to a professional dry cleaner that specializes in cleaning suede. Smooth leather: Test cleaning methods in an inconspicuous place and proceed with care. If your garment or accessory is very expensive and you will be devastated if you ruin it, take it to a professional cleaner. Vinyl, pleather, or faux leather: You can begin cleaning straight away. Ballpoint pen ink: Proceed with cleaning method. Felt tip marker ink: Proceed with cleaning method. 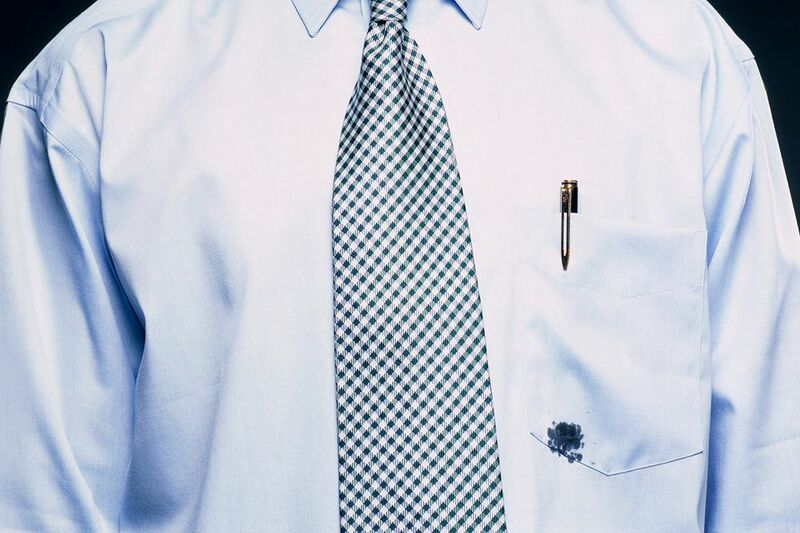 Permanent marker ink: Consider having your garment dyed a darker shade to match the stain. Permanent ink cannot be removed from leather without causing a great deal of damage to the garment. Professional dry cleaners or shoe repair shops can dye leather. Isopropyl alcohol—plain old rubbing alcohol—works best for home removal of ink stains from leather. Fresh ink stains are easier to remove and usually come out easily while older stains may require repeat treatments. Leather is porous and the stain can penetrate deep into the hide. Begin by dampening a white cotton cloth or cotton swab with the alcohol. Don’t use a colored cloth because it can transfer dye to light colored leather. Work from the outside of the stain toward the middle by dabbing with the cloth. Keep the work area small so you do not spread the ink into a bigger area. You should be able to see the ink transfer to the cloth. Dampen a clean area of the cloth or get a new swab as you see ink coming off to prevent re-staining the garment. Keep gently blotting away until the ink is gone. Do not scrub harshly as that can remove color and a layer of the leather. You can also use commercial ink removers like Amodex Ink & Stain Remover or Ink B Gone. Allow the garment to air dry after or between treatments. Once the ink is removed, treat garment with leather conditioner to help it remain supple and smooth. You may have heard about using hairspray, dish detergent, laundry soap, mayonnaise, and abrasive erasers to remove ink from leather. Yes, someone from somewhere has had success using these methods, but they can’t be recommended. The abrasive erasers will probably remove the ink but they will also remove a layer of the leather so you’ll need to decide if you want a stain or a hole. Perhaps the best of the bunch is hairspray as it contains high alcohol content, but the other ingredients in the hairspray can cause staining and other problems. Only use it in an emergency on a fresh ink stain. Ball point pens are a staple in most homes and offices and they seldom leave as many stains as the old fountain pens and turkey quills. Sometimes ink stains do happen, however. So how do you remove ballpoint ink stains from clothes? Begin by wetting a cotton swab with isopropyl or rubbing alcohol and testing the fabric to be sure the alcohol does not damage or discolor the material. Test on an inside seam or hem. Working from the outside of the stain to the inside, dabbing the spot with the swab. Change to a new swab as ink is absorbed to keep from redistributing the ink. If traces of the ink remain, mix a solution of oxygen-based bleach (OxiClean, Clorox 2, Country Save Bleach, or Purex 2 Color Safe Bleach) and cool water. Follow the package directions as to how much product to use per gallon of water. Completely submerge the garment and allow it to soak for at least eight hours. Check the stain. If it is gone, wash as usual as directed on the label. If it remains, mix a fresh solution and repeat. It may take several soakings to remove the stain, but it should come out. Just be patient! A Sharpie or permanent ink marker is great when you want an autograph to last on your t-shirt, but not when a random slash goes across your sleeve. Permanent ink is usually almost impossible to remove (especially from colored clothing) but there are some things you can try that might work. First, wet a cotton swab with rubbing alcohol and test the fabric to be sure the alcohol does not damage or discolor the material. Working from the outside of the stain to the inside, dab the spot with the swab. Change to a new swab as ink is absorbed to keep from redistributing the ink. Launder according to the fabric label directions. If traces of the ink remain, mix a solution of oxygen-based bleach (OxiClean, Clorox 2, Country Save Bleach, or Purex 2 Color Safe Bleach) and cool water. Follow the package directions as to how much product to use per gallon of water. Completely submerge the garment and allow it to soak for at least eight hours. Check the stain. If it is gone, wash as usual. If it remains, mix a fresh solution and repeat. If the ink just won't come out, consider dyeing the garment a dark color, putting an embellishment like a patch, ribbon, or button over the stain, allowing your child to create a new design with permanent markers for an individual look, or using the clothes as play or painting clothes. Some so-called washable markers are not as washable as others. Some brands just don't wash away as easily as they claim on the box! Here's how to remove these stains. Wet a cotton swab with rubbing alcohol and test the fabric to be sure the alcohol does not damage or discolor the material. Working from the outside of the stain to the inside, dab the spot with the swab. Change to a new swab as ink is absorbed to keep from redistributing the ink. Launder according to the fabric care label directions. Check the stain. If it is gone, wash as usual. If it remains, mix a fresh solution and repeat.